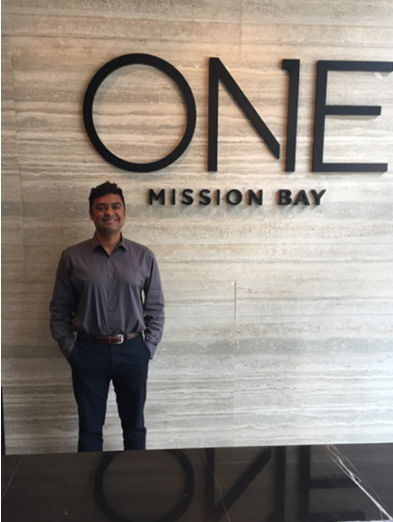 Our Sales Coordinator at ONE Mission Bay, Guru Prabhakara is eager to work with a team that is so dedicated and passionate about helping clients find their dream home. Guru shares what residents can get excited about living at OMB, what makes San Francisco special and his favorite outdoor activities. Answer: OMB’s location to mass transit makes it easy for residents to get around. Caltrain is a great way to get up and down the peninsula and access to it is a short walk. I’m an avid train rider myself so proximity is definitely a plus. You can even bring your bike on the train! Question: What makes San Francisco stand apart from other cities? Answer: San Francisco offers open and diverse culture, a pioneering tech industry, and exquisite cuisine. The city also boasts amazing natural beauty, whether it’s our beaches, national parks, or wine country which is perfect for a weekend getaway. Question: What are some of your favorite outdoor activities in the city? Biking Around the City – It’s convenient, provides a good workout (those hills! ), is environmentally friendly, and is a great way to get to know your neighborhood. It’s such a thrill as well! Picnic in Golden Gate Park – There’s so much to do at the park: stroll the botanical gardens, visit the De Young Museum, rock out at the recently held Outside Lands Music Festival, the list goes on. Hike in Lands End – Lands End offers stunning views, beautiful flora, and taking visitors to the Sutro Baths is always a treat. Neighborhood Festivals – San Francisco has a number of neighborhood festivals including the North Beach Festival. Attendees can savor amazing food, music, and drink. Kayaking or Standup Paddle Boarding – McCovey Cove during a Giants game is the perfect chance to catch a splash hit. The best part? It’s so close to ONE Mission Bay!